Starstuck? Prof, students examine "cool gas and dark matter"
It’s the last step Skidmore ever asks its students to take, it requires about four seconds of their time, and it’s easy as pie. Coming offstage at Commencement, with that cherished diploma secure, each new-minted grad stops in front of a Skidmore banner, plants both feet squarely on a pair of footprints taped to the concrete floor, and smiles for the photographer. 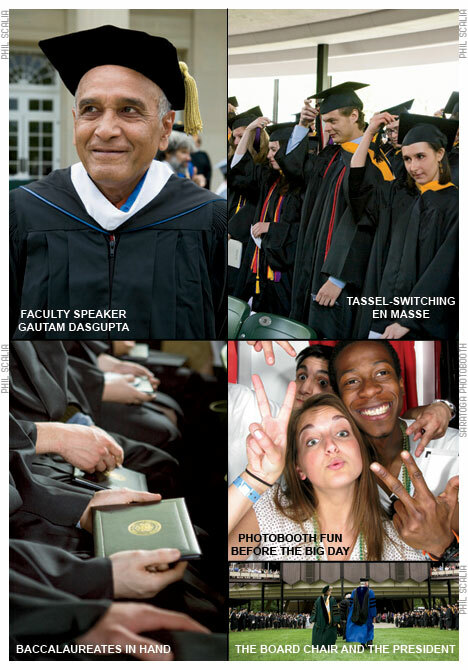 This year, on May 16, a record number bounded offstage for that split-second pose—684 undergraduates, including 37 from Skidmore’s University Without Walls, and 18 grads from the Master of Arts in Liberal Studies program. To help the Class of 2009 cope with all they’re stepping off into—war and recession and job prospects darker than the inside of a mortarboard—a series of honorary-degree recipients and other speakers offered their best advice, ranging from an environmental wakeup call to an artistic insight to a virtuosic defense of liberal arts. Financier and conservationist Carter Bales pulled no punches: “Mankind is the ultimate nuisance species.” Cofounder of the private-equity firm Wicks Groups of Companies, Bales is also an activist for the Climate and Grand Canyon Trusts, the Echoing Green Foundation, and the New York State Foundation for Science, Technology, and Innovation. Human activity is rapidly degrading nature, he warned, with “global weirding” already resulting in floods, droughts, wildfires, species extinction, rising sea levels, and more. Unless we want to “say goodbye to life on earth as we know it,” he said, we must cap carbon emissions, mandate energy efficiency, invest in new green technologies, and support trees and grasslands.